Do you have a child at home who does everything but read? Are you having a hard time getting him / her to sit down with a book, even for 10 minutes? If you are reading this article, chances are that you have answered the above questions in the affirmative. Well that’s the bad news. But good news is that it all depends on you whether your child will take a liking to books or not. If you are wondering what can you, as a parent, do to get your child to experience the wonderful world of books and the joy of reading, then read on. Children do what they see their parents do, not what we say. So if you want your child to read, drop everything and grab a book of your choice. You do not have a book at home or a library in vicinity, no problem: Pick up the newspaper (newspaper as in actual paper, not the online version). You do this on a consistent basis, especially when your child is around, and sooner or later, you will notice your child becoming more inquisitive about books and reading. Using your child’s favorite soft toy / puppet while reading out to him / her makes a huge difference. You can bring to life the various characters of the book and engage in role play activities, leading to a more interactive and engaging reading session. Children are generally more inclined to listening and reading out to their "friend and partner in crime" i.e. the soft toy / puppet etc. In fact, a team of Japanese researchers recently published a study on the secret to getting your child to read, and as per them, the secret might just lie in the way you use your child’s favorite soft toy / puppet. So go ahead and make the best use of the soft toy / puppet. You can make it even more realistic by giving your child his / her own Oh! My Name personalized book which comes along with a puppet of one of the main characters in the book. Reading out a story to your child should not be a drill, neither for you and nor for the child. It should be an interesting and fun filled experience which the child enjoys and looks forward to. And it entirely depends on you (i.e. the one reading out the book) as how you can make it an interesting and a lively affair. As it is commonly said, don’t just read the story to your child, rather sing, shout aloud, whisper, murmur out the story. Use intonation to vary your voice’s pitch. Don’t just say “haha hehe”, when both, you and the child can yourselves go “HAHA HEHE”. Remember, children books are not supposed to be just read out, but to be lived out. The keyword here is not just a book shop but a “stand-alone” book shop. Let me explain: Have you ever tried taking your child to any bookshop in a mall or any other high upscale market? The first time I took my daughter to one of those high end book shops, she kept running back to one of the candy bars right next door or to the Disney stall who all the miniature versions of her favorite superheroes. After struggling on few more occasions, I stopped going there and instead took her to a not-so-fancy-yet-good-enough book shop in our neighborhood market, which hardly had anything interesting enough to distract her. And BINGO! We ended up spending ~20 min in the shop before her patience ran out. Those 20 minutes have now gone up to an hour which she happily spends browsing through various books. For the past couple of years, my daughter and I have been playing this “A very long story before bedtime” game. Every night before putting her to bed, we take turns to create a long story, or rather a very long story. Here’s how it works: I generally start the story with the usual “Once upon a time…” (I know I lack imagination) and continue for ~30 sec. She then picks it up from where I stop and builds upon it. She continues for ~30 sec and then it’s my turn again. The cycle continues till one of us runs out of his / her creativity (and more often than not, that happens to be me). But on the positive side, I have seen her developing more keen interests in books, probably because she knows books are the best tool to fire up her imagination, a much needed ammunition for her daily duels with her father. 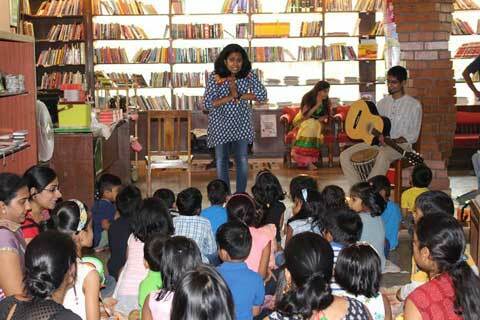 Getting your child join or attend a story telling session is one of the best investment you can do as far as your child’s reading habit is concerned. Apart from helping him / her have better vocabulary and listening skills, there’s one more often overlooked advantage of storytelling sessions. And that is, it fosters learning through companionship and friendship. A lot of children don’t just go to these sessions to listen to stories but to meet their friends and talk, laugh and also learn along with them. It is this combined learning which I believe is the most important aspect of the story telling sessions. So there you have it, try one or all of the above and see how your child responds. 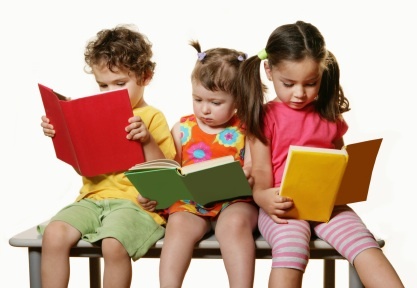 Most probably, you are going to see a positive change in your child’s reading habits. All of us are aware of the Indian mythological warrior Abhimanyu, who learnt about Chakravyuh (aka the secrets of warfare) while in his mothers’ womb. Now, as per a study conducted on babies’ language learning abilities, there is now scientific evidence that babies do learn language skills even before they are born. So if you and your partner are expecting a new member in your family, don’t waste any time, just get hold of some books and start reading them aloud. The truth is that every child likes books, provided he / she is given the right book and the right environment. So next time, you find yourself thinking that your child probably does not like reading, think again. You probably just need a dash of creativity along with some persistence to get your child interested in the art and science of reading.